As a senior in high school, Abby was looking for a Christian college where she could get a broad education and build meaningful relationships with students and professors. She chose Northwestern because it was also one of a handful of Christian colleges that offered an advanced undergraduate actuarial science program. During her time at Northwestern, she served as a math tutor, professor’s assistant and actuarial intern at Principal Financial Group in Des Moines. After graduation, she was hired as a pricing analyst for Nationwide Insurance. How well did Northwestern prepare you for your career? Northwestern’s size meant I had the opportunity to be involved in many different activities, which taught me how to manage my time well and work independently. In my classes, I learned valuable technical skills as well as crucial communication abilities. I was also able to develop and practice leadership skills through participation in short-term mission trips and serving as an orientation leader for new students. My experiences at Northwestern have made me a well-rounded analyst with both the practical and theoretical skills needed to succeed as an actuary. What’s one of your favorite memories from NWC? For two years I served as a teaching assistant for a religion professor. One year for his birthday, I recruited some friends and we spent the evening newspapering his office with old editions of the Wall Street Journal. He was speechless when he walked into his office the next day! What did you most appreciate about your math mentors? The Northwestern math professors are both brilliant and approachable. When they give difficult assignments, they encourage students to drop by their offices to work through the challenging parts together. The math professors are also engaging lecturers and set high, but achievable, standards. The professors genuinely want to get to know you outside of the classroom and they are intentional about building a personal relationship with you. How did your internship help you find a job? I spent the summer before my senior year working for Principal Financial Group as an actuarial intern in the specialty benefits area for disability insurance. At the conclusion of the summer, I was offered a full-time job following graduation in the spring. Although I declined the offer, the internship experience was invaluable when I began seeking other full-time job opportunities. I believe having the internship on my résumé was one of the key reasons why I easily secured a job with Nationwide. The experience provided me with real workplace projects and responsibilities to discuss during job interviews, which I think set me apart from other candidates. 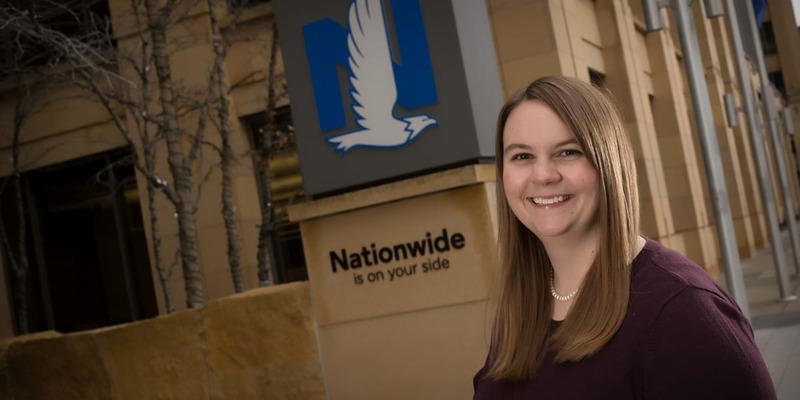 I have had many different responsibilities during my tenure with Nationwide, and I am looking forward to settling into a more permanent role. I want to continue to expand my sphere of influence and diversify my skill set. Since I am a new people-leader, I want to practice and improve my leadership capabilities. In the distant future, I would like to try teaching at a college or university and perhaps spend time working overseas.